1,515 pages of open source research on Richard Nixon and documents demonstrating its use, compiled by the Kennedy campaign and its surrogates. The United States presidential election of the 1960 was among the most closely fought in American history. On November 8, 1960, Senators John F. Kennedy and Majority Leader Lyndon Johnson won the presidential election with 49.7 percent of the popular vote against 49.6 percent for Vice President Richard Nixon and Henry Cabot Lodge. 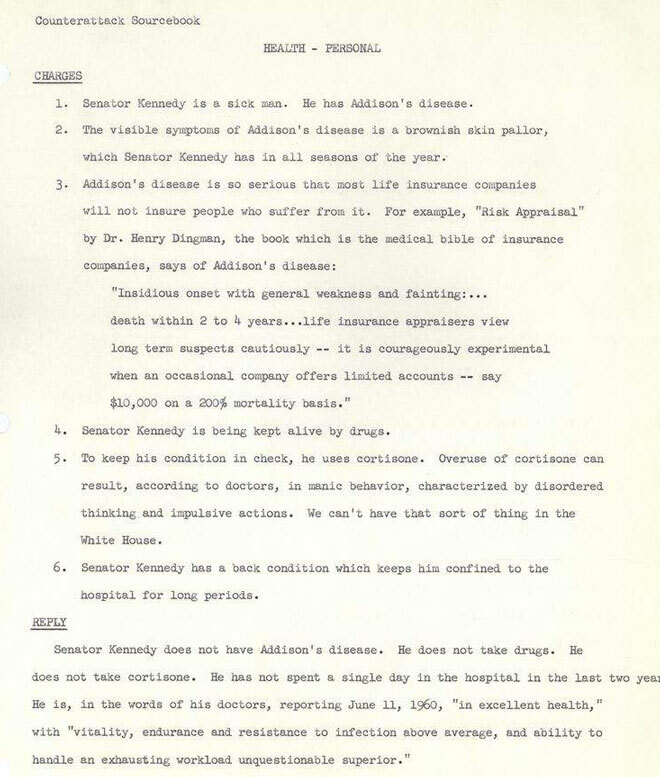 The material collected in this research set includes files created or received by the Kennedy campaign derived from many sources including the Congressional Record, Nixon speeches, media clippings, and transcripts, and campaign materials. The material includes correspondence, memoranda, publications, press releases, documents regarding Vice President Richard M. Nixon's campaign strategy and suggestions for defeating him in the 1960 presidential campaign. The largest section in this set is the compilation, "What Nixon Said A Collection of his Public Utterances 1946 to 1960". This cut and pasted, lose leaf 3 volume, 632 page compilation, along with its 80 page addendum is referred to as the "Nixonpedpia," by the staff of John F. Kennedy Presidential Library and Museum, in Boston, Massachusetts. "What Nixon Said" (1946-1960) was created by the Democratic National Committee and presented to the Kennedy Campaign. It contains short, medium, and long quotations of statements made by Richard Nixon during Congressional proceedings, in speeches, press conferences, campaign material, newspaper, magazine, radio and television interviews. Each entry has a source citation. Federal budget, including the 1960 Republican Party platform, balancing the budget, and national defense spending. Civil liberties, including censorship, congressional witnesses, and wiretapping. Civil rights, including voting, desegregation of schools, the South, employment, and the Republican Party's record on civil rights. Economic policy, including domestic spending, inflation, unemployment, the economic record of the Democratic Party, and economic accomplishments of the Republican Party. Education, including Federal aid to states, the Federal student loan program, and teachers' salaries. Role of government, including the Electoral College; federal, state, and local governments; nepotism; and the relationship between the President and Congress. Internal security and communism, communists in government, education about communism, and the House Un-American Activities Committee. Labor issues, such as strikes; labor-management relations; and legislation, including the Taft-Hartley bill. Natural resources, including hydro-electric power and the water in California. Taxes, tax cuts, and tax reform. General welfare including government spending and social programs, including Social Security, public assistance, and health care for the aged. National defense, including military strength, defense spending, and reorganization of the military. National security including disarmament, relations between the United States and the Soviet Union, atomic energy, satellites, the missile gap, and nuclear testing. The draft and universal military training. Mutual security, including military assistance and the distribution of foreign aid. National security: scientists and engineers, including the need for greater education in the science and engineering fields, and competition between the United States and Soviet Union. U-2, the use of U-2 aircraft to conduct aerial surveillance over the Soviet Union. Colonialism and its effect on communism, trade, and international relations. Economic aid, foreign aid, and international relations. International conferences, including the 1955 Geneva Summit and the 1960 Paris Summit. Africa, and the creation of the Bureau of African Affairs within the United States Department of State. Europe, United States policy towards European countries, particularly Germany, Hungary, and Poland. Middle East, particularly Iran, Israel, and the Egyptian city of Suez. 1952 presidential campaign and candidate Governor Adlai Stevenson. Wisconsin Senator Joseph R. McCarthy, and the culture of McCarthyism. Smear tactics and other negative methods in campaigns. Political campaigns and verbal attacks on President Harry S. Truman, Secretary of State Dean Acheson, and Governor Adlai Stevenson. Nixon calling President Harry S. Truman, Secretary of State Dean Acheson, and Governor Adlai Stevenson traitors to the principles of the Democratic Party. "War Party," Nixon expressing concern about the existence of a political "war party" within the United States. Nixon on the Office of the Vice President of the United States, including his own duties and responsibilities as Vice President under President Dwight D. Eisenhower. Others subjects include: Agriculture, Antitrust, Corruption and Ethics in Government, Debt, Highways, Housing, Monetary Policy, Small Business, Socialism, Veterans, Foreign Service. Immigration, Neutrality, Trade, Tariffs, United Nations, Cabinet Appointments, Religion and Personal Philosophies and Observations. 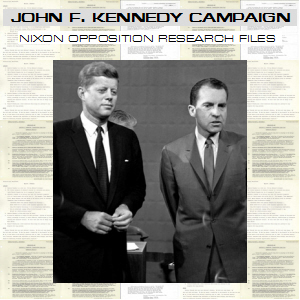 Counterattack Source Book - Contains information derived from memoranda, briefing papers, public statements, campaign literature and advertising, and position papers regarding issues often or potentially mentioned in opposition to the election of Senator Kennedy, raised by the Nixon 1960 presidential campaign, and others, along with potential responses. Compiled in this volume are many charges made against Kennedy followed by recommended replies and comparisons to Nixon. Vice President Richard M. Nixon's congressional voting record from 1947 to 1960 (As Vice President (1953 to 1961), Nixon in his role as President of the Senate, eight times casted a tie breaking vote in the Senate) collected by Senator John F. Kennedy's 1960 presidential campaign. A folder titled, "Nixon Promises," containing statements made by Nixon and his position on various topics, such as civil rights, agriculture, and the economy, during the presidential campaigns of 1952 and 1956. A folder containing letters, newspaper clippings, and pamphlets supporting Vice President Richard M. Nixon in the 1960 presidential election and opposing Senator John F. Kennedy based primarily on the religious issue. 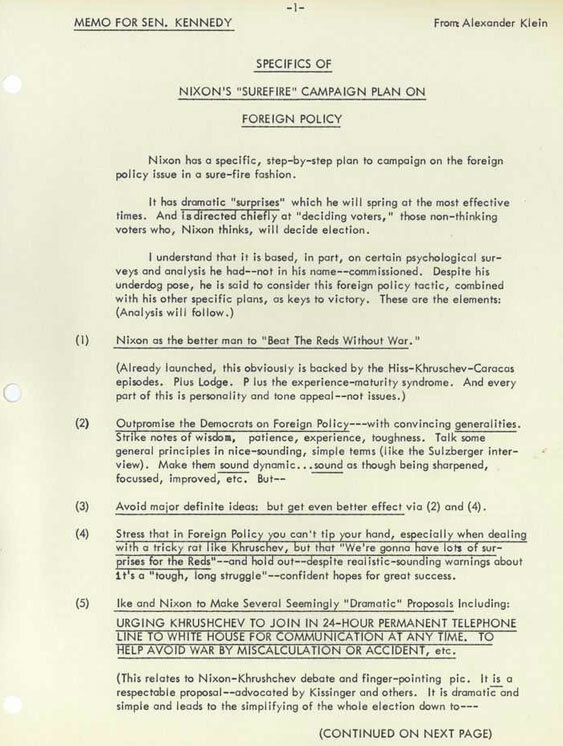 A binder containing an index of contradictory quotes made by Vice President Richard M. Nixon on various topics. Also included are a record of his defense and foreign policies, international travels, and his Congressional voting record. Copies of bulletins published by the Democratic National Committee (DNC) titled, "Correction, Please!" devoted to addressing the issues raised by Vice President Richard Nixon during the 1960 presidential campaign. Folders containing briefing papers and memoranda providing background information and suggestions for Senator John F. Kennedy as he prepared for debates with his opponents during the 1960 presidential campaign. 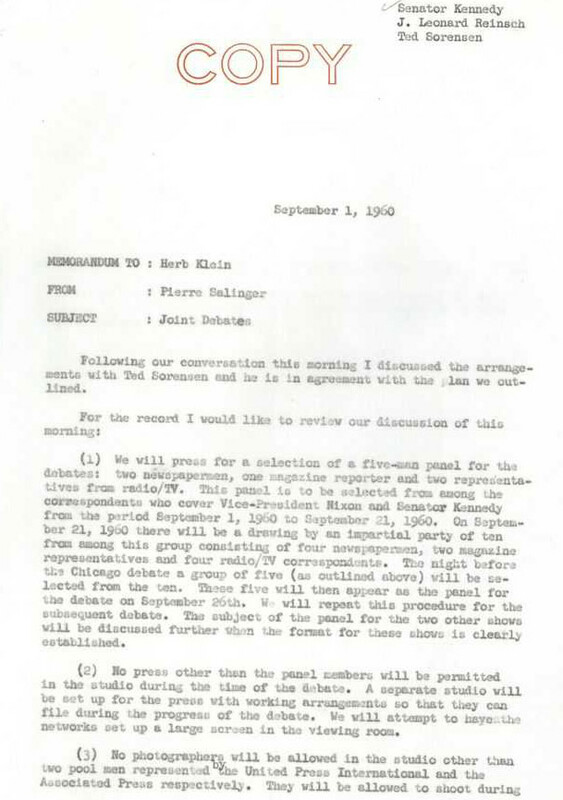 Materials include a memorandum regarding policies governing members of the press and a transcript of the first Kennedy-Nixon debate. A memorandum concerning the last nine days of Senator John F. Kennedy's 1960 presidential campaign.